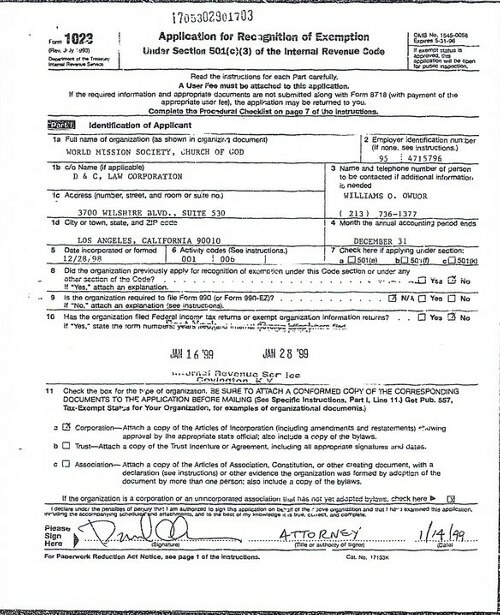 In January 1999, the World Mission Society Church of God submitted their application to the IRS for recognition of tax exemption for their Los Angeles, California location. According to the IRS Tax Guide for Churches and Religious Organizations, churches that meet the requirements of a 501(c)(3) organization are not required to file an application for tax exempt status. Contributors to an organization that has been recognized as tax exempt by the IRS generally benefit from tax deductible contributions. IRS Form 1023 is the application that a non-profit entity fills out in order to obtain tax exempt status. 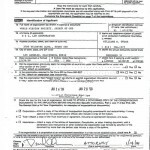 These applications are kept on file by the IRS and can be requested by any member of the general public. The form that a member of the general public must fill out in order to receive a copy of the entity’s tax exempt application is called Form 4506-A (instructions for filling out Form 4506-A). The World Mission Society Church of God does not formally disclose any information about where the donations received by their members are allocated. This leads one to ask the question, “Where does the money go?” When I was a member, I was never told how much money was collected, where it was spent, and for what purpose. The lack of financial transparency within the WMSCOG leads me to ask further questions. First of all, baptisms are conducted in the WMSCOG at any hour of any day. The scheduling of baptisms must be something that has changed over the years. Wedding ceremonies to join devoted members? Does that mean that the WMSCOG does not marry members to non-members of the church? Funeral services? When I was a member, not only were members not allowed to attend funeral services for their deceased family members, but I was told that no member of the WMSCOG has or will ever die. Yet on the application, the WMSCOG claims to arrange funeral services for members of the congregation and their family members. What about Ahnsahnghong? There is absolutely no mention of him here. Why would the WMSCOG chose to leave that piece of information out if they believe Ahnsahnghong to be “god”? The WMSCOG preaches that without “god the mother” one cannot be saved. Why isn’t ZhangGilJah mentioned here either? 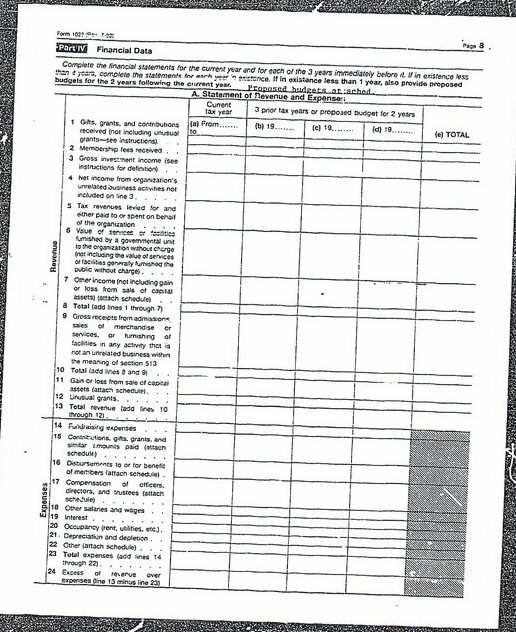 Page 4 (Part III) – Question number 11 asks if the organization is a membership organization. 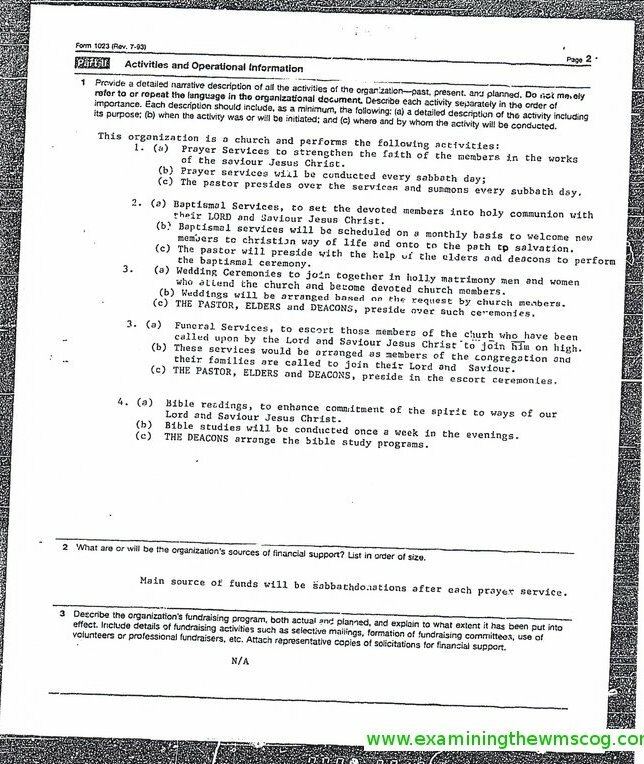 The WMSCOG checked off “NO” and although they were not required to fill out sections a, b, and c, they claim that members will receive “spiritual uplifting and fulfillment of christian lifestyle” in exchange for payment of membership dues. Joo Cheol Kim Founded the WMSCOG in 1998? 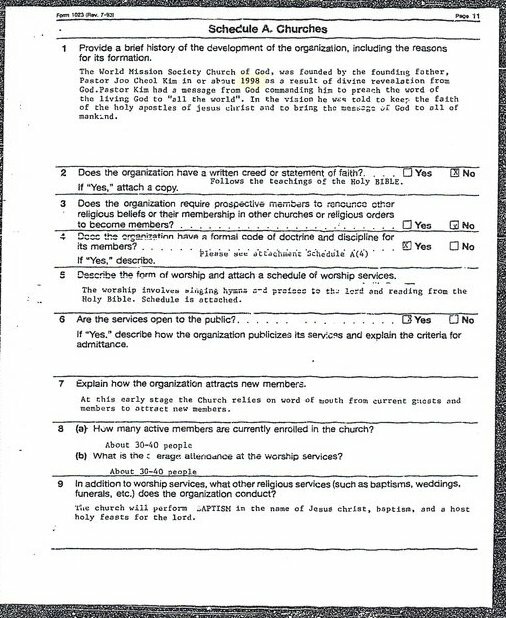 On their application for tax exemption, the World Mission Society Church of God tells the IRS that the organization was founded by Joo Cheol Kim “in or about 1998” (apparently they are not really sure). But on their official website, the WMSCOG clearly states that their church was founded by Ahnsahnghong in 1964. 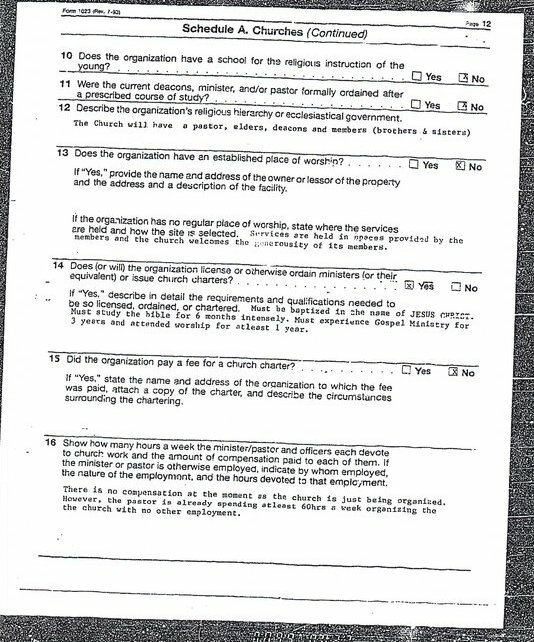 Why would the WMSCOG deny the founder of their organization on their application for tax exemption, if they believe Ahnsahnghong to be “god”? Membership to the WMSCOG and Other Churches? Question number 3 asks if the organization requires prospective members to renounce other religious beliefs or their membership in other churches or religious orders to become members. The WMSCOG checked off “NO”. This is an obvious fallacy because WMSCOG members will not visit other Christian churches because they view them as pagan for worshiping on Sunday. When I was a member of the WMSCOG, I was told that if I entered another Christian church, that Satan would have the opportunity to “kill me spiritually”. Baptism in the Name of Jesus? No Mention of Ahnsahnghong? In this video, the WMSCOG claims that people should be baptized in the name of the Holy Spirit (Ahnsahnghong). Yet they omitted this detail from their application for tax exempt status. Again, there is no mention of Ahnsahnghong or ZhangGilJah. Why does the WMSCOG chose to omit these details that they view as foundational to their doctrine? When I was a member and I completed the “Tithes and Offerings” study, I was told that none of the pastors, missionaries, or deacons were paid by the church. I was told that everyone obtained their income from “jobs” outside of the church. 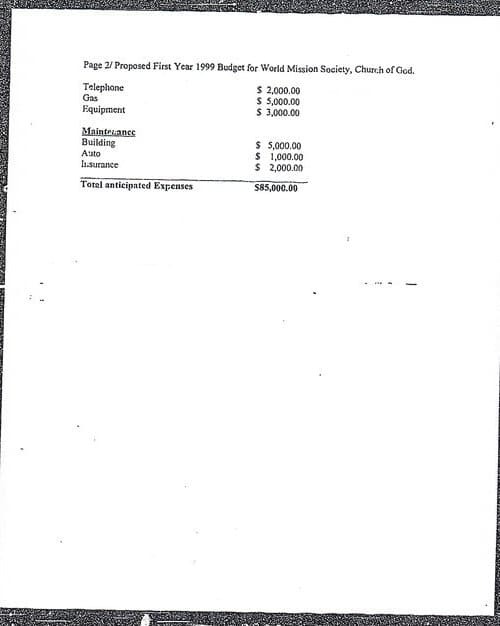 Interestingly, in response to Page 8 Part IV, the WMSCOG attaches their proposed budget for 1999, 2000, & 2001. 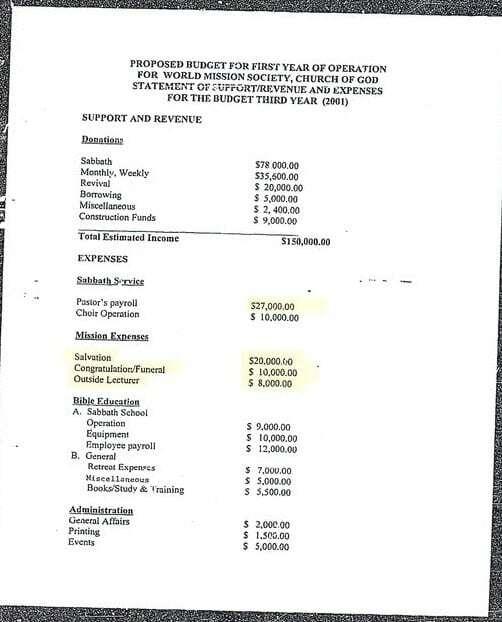 Why did the WMSCOG budget for a “pastor’s payroll and employee payroll”, when they claim that none of the pastors, missionaries, or deacons get paid? The total estimated income increased by 29% and 36% respectively over two years. 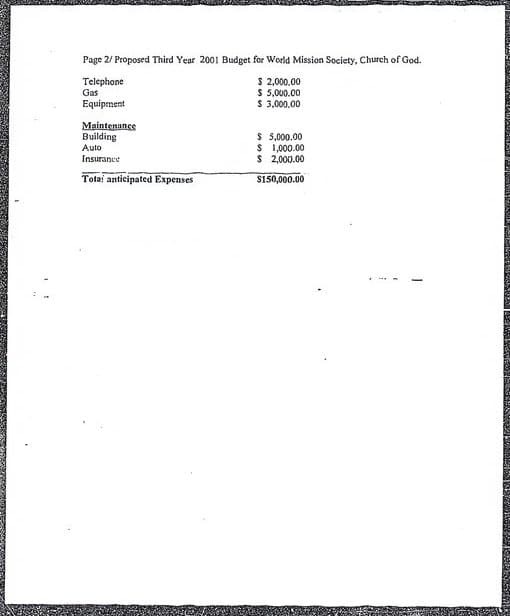 The money budgeted for the pastor’s payroll increased 70% and 59% for the same two years respectively. Why such a disproportionate increase in the pastor’s payroll? When I was a member I was told that the orchestra members purchased their own instruments. I was also told that the choir members purchased their own “choir outfits”. 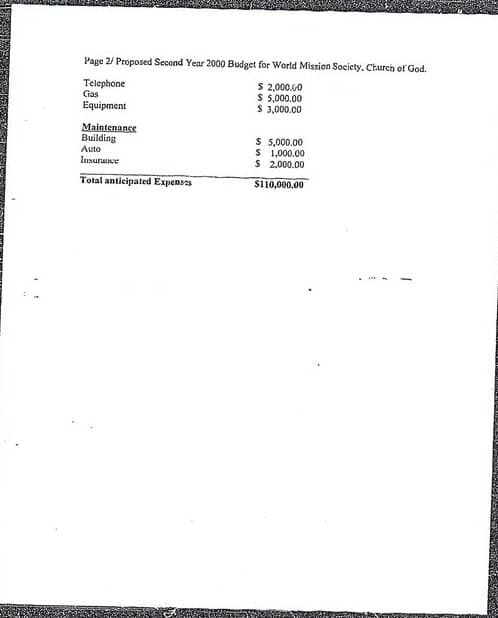 Why does it cost up to $10,000 to operate a church choir at the WMSCOG? What is the money budgeted for “salvation” used for? Why does salvation cost up to $20,000? 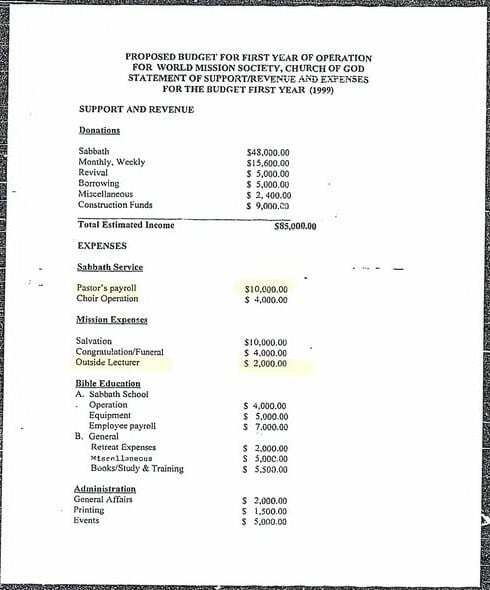 There are monies budgeted for “congratulations/funeral” even though the WMSCOG does not conduct funerals. Not only is there a budget for this activity, but the budget increased by 50% and 67% respectively. Where did the WMSCOG plan to spend this money? When I was a member, I heard the WMSCOG announce the cost for members to go on “short-term preaching missions”. The amount each member was required to pay for these trips was approximately $500/person. What would the “retreat expenses” be used for if each member pays for their own travel and lodging expenses? Below is a table that summarizes the data included in the WMSCOG proposed budget for 1999, 2000 & 2001. There seems to be great disparity between what the WMSCOG reveals to its members about their finances and what the WMSCOG reveals to the IRS. Why would the WMSCOG claim to their members that “no one gets paid” during the “tithes and offerings” study, and yet submit a pastor/employee payroll? 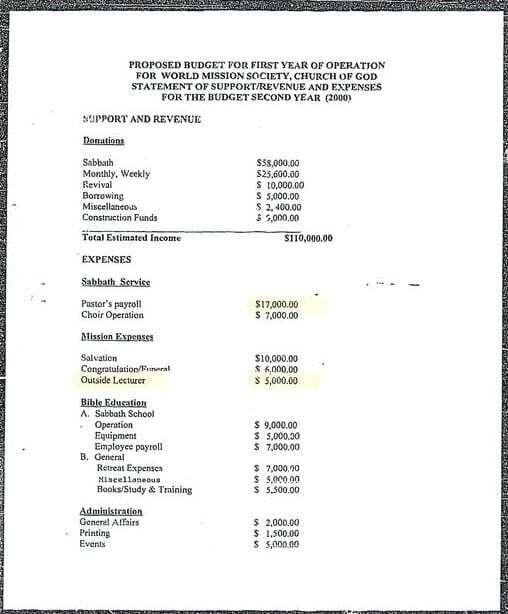 Why would the WMSCOG budget for funeral services when they discourage their members from attending them? A review of publicly available documents reveals tremendous inconsistencies. If you are a member, you may want to reconsider donating 10% or more of your income to this organization. 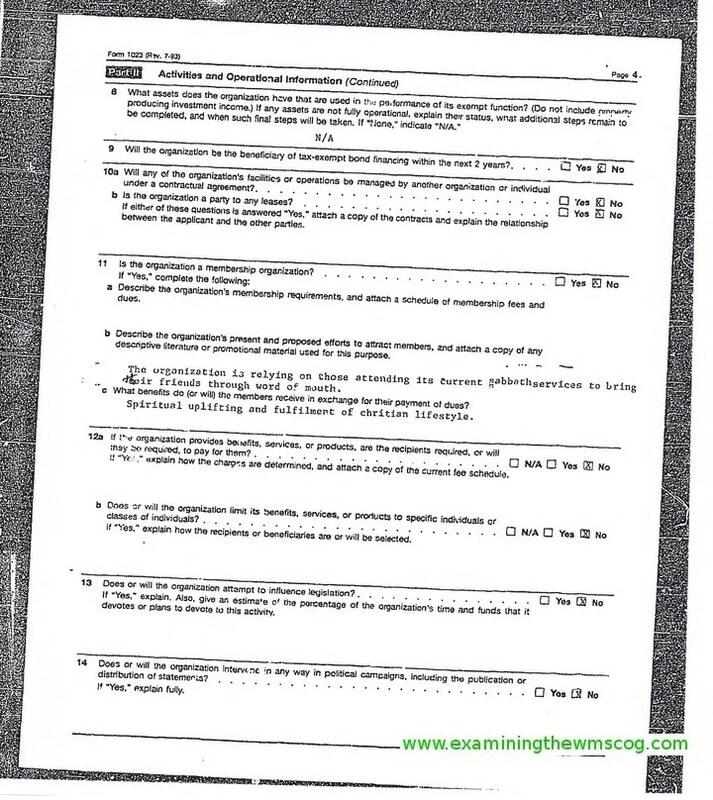 Next, we will examine the application for tax exempt status that the WMSCOG in Bloomingdale, Illinois submitted to the IRS in 2000. Click here to download the complete copy of the 1023 Application filed by the WMSCOG Los Angeles, CA described in this article. What’s upsetting is that the current members, generally, don’t see this as relevant information. I think information about a church that is “masquerading as apostles of [Jesus] Christ” (2 Cor 11:13) is highly relevant. Like it was mentioned, if Ahn is God and the current Saviour, why do you tell people otherwise? The Apostles have “testified to the truth” (John 5:33). Joo, whom the church claims as the founder, is not testifying to the truth. Whoever is in on this scheme shall get what’s deserved because “a fortune made by a lying tongue is a fleeting vapor and a deadly snare” (Pro 21:6). They trick people into believing they’re regular everyday Christians with no “odd” beliefs. This deceitfulness is a ***RED FLAG***. Free yourselves from the “cunning and craftiness of people in their deceitful scheming” (Eph 4:14).